Due to the fact on the wedding day events happened at the speed of light, which is normal at an Indian Wedding, the bride and groom suggested that we do a post wedding photo shoot. As such, a few weeks after their wedding at Toronto Botanical Garden and only days before the bride and groom went on a 6 month honeymoon around the world, we went to Downsview Park, located north of Downtown Toronto. 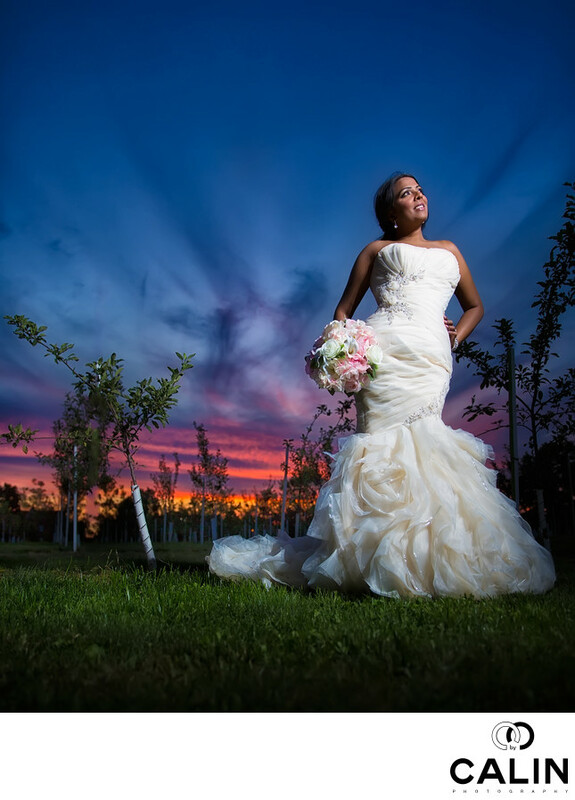 Downsview is huge and has a variety of elements that can create elements of interest in a wedding photo. For example there is a pond, a little forest, a hangar, open space, isolated trees and a hill. A big advantage of the park is that the city does not require a wedding photography permit, so the couple saves a few hundred dollars. Finally, there is always available parking at Downsview Park either in the park or on the adjacent streets. For all the advantages stated before, I am a firm supporter of having photo shoots in the park. The newlywed couple loved the idea and we decided to meet in the afternoon for a 4-5 hour shoot. First, we started taking photos for the thank you cards, then the bride and groom got dressed in their traditional Indian clothes and we did some Bollywood shots. This was a very funny photo shoot. As the guys are usually less inclined to spend time being photographed, I suggested that the groom brings a bottle of wine or champagne so he is more relaxed and enjoys the process better. To my surprise he pulled out a bottle of Dom Perignon and opened it. We all had a few sips or some of us a glass or two and the photo shoot went really smoothly afterwards if you know what I mean. After the part where the couple were dressed in traditional Indian outfits, they got changed in western clothes. This particular shot was created at sunset when I noticed a splendid orange light at the horizon, contrasting with the intense twilight blue of the sky. I asked the bride to place her wedding bouquet at her feet, posed her so that it accentuated her flawless body shape and turned her face towards the light. To illuminate the scene I used a simple flash placed on a light stand and diffused through an umbrella. I gelled the flash with a CTO gell and set the white balance to tungsten. That in effect created the illusion of an even more intense sky. Many brides saw this photo and asked me asked me if it was done in Photoshop. The truth is that one does not need much Photoshop in wedding photography if one knows what he is doing. This image was created 99% in camera. Toronto Botanical Garden website can be found here.